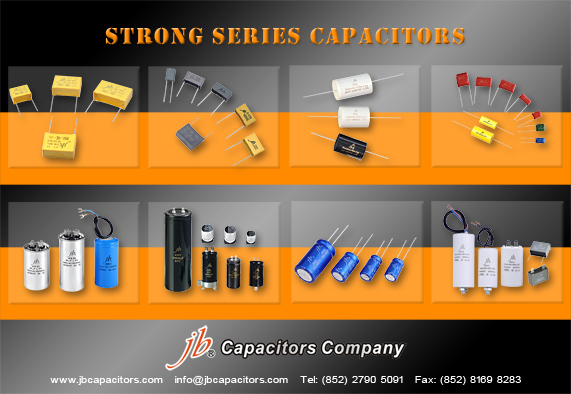 In this special celebrating season, jb Capacitor want to share with you our super popular Motor Starting Capacitors Series, which comes with UL and cUL approvals and three different types. You name it, we have it! Quickly send us your RFQs by email. Special promotion within offer in this celebrating season. 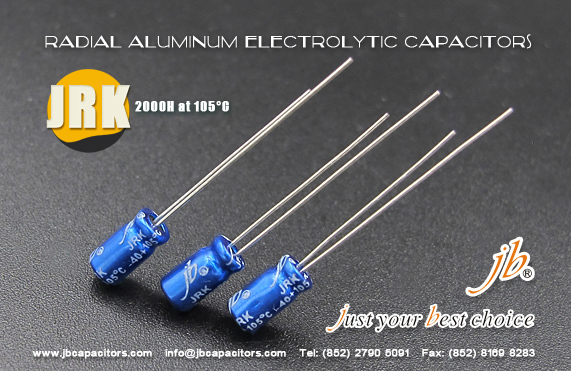 I bring you another our strong series radial type aluminum electrolytic capacitors JRK serires, it is miniature, height 7mm THT type aluminum electrolytic capacitors. We have very competitive prices and short lead time(around 3~4 weeks), Check below our competitive offer, welcome your RFQs. jb has always insisted on providing distinguished products and competitive price to our clients and we have won the trust of customers around the world. 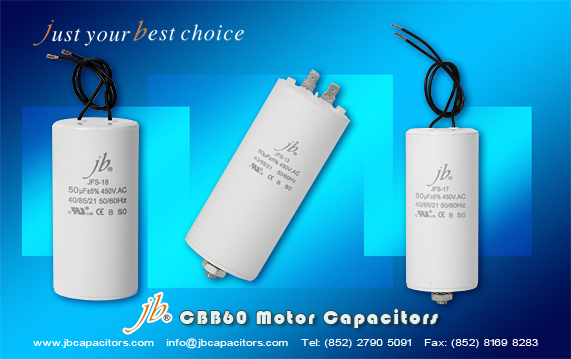 CBB60 Motor Capacitors are especially in great demand in some countries of Southeast Asia, the Americas, Africa and the Middle East. 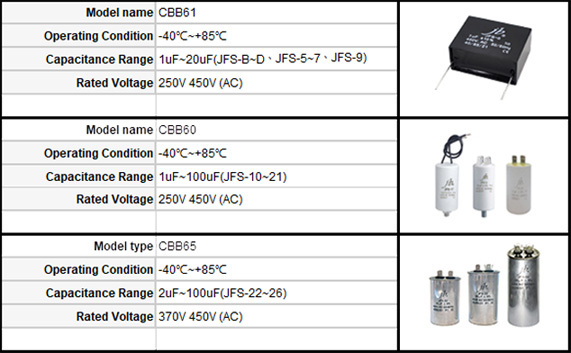 Therefore, jb intends to find distributors of CBB60 Motor Capacitors in these countries. If you have intention to be our distributors, please hurry to contact with us, we are waiting for you to join us! Recently, the weather is extremely hot, the Observatory of China has been repeatedly announced the hot occurrence of the Red and Orange. In order to take good care of our employees, jb. Our production line workers will enjoy one week holiday, while our sales office will still open from Monday to Friday to serve our customers. If you want to place an order, please contact with us as soon as possible to speed up the production time! which mainly speciallized in MKT&MKP film capacitors, motor running capacitors and SMD, radail, large can aluminum electrolytic capcitors. Nowadays, we have greatly promotional activities on strong series products. More favorable prices and faster delivery time are supportive! Should have any interest, please just be free to send us your RFQ list, let's help you cost down. It will be a great pleasure to hear from you. Thank you. 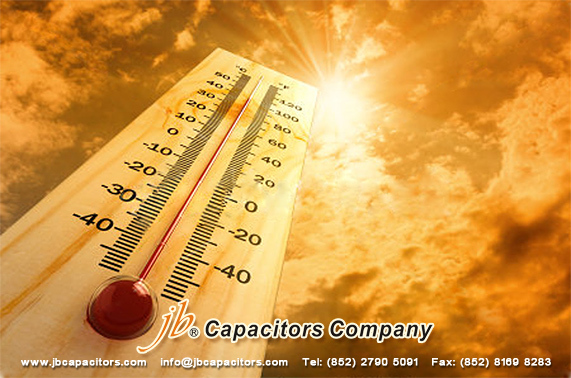 jb JFS Series capacitors are hot selling in the market with UL and cUL approvals. 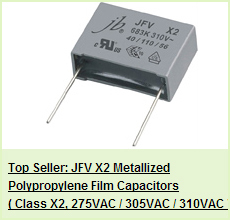 Here, we bring you a piece of good news that jb JFS Series capacitors’ price is more competitive than before. It is a best time for you to grab on this chance with favorable price and high quality product. 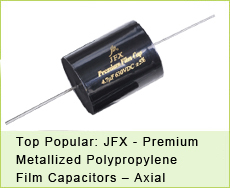 Capacitors JFS-11~18 has been updated. You can check the new drawing and size on it. Please feel free to contact us at any time if you have any questions want to know. 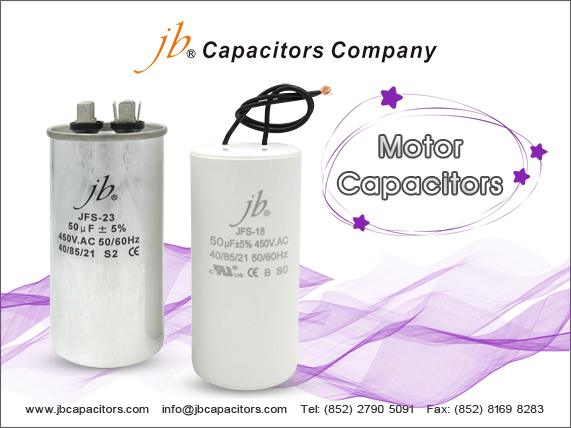 jb Capacitor is your best choice. We are looking forward to cooperation with you. 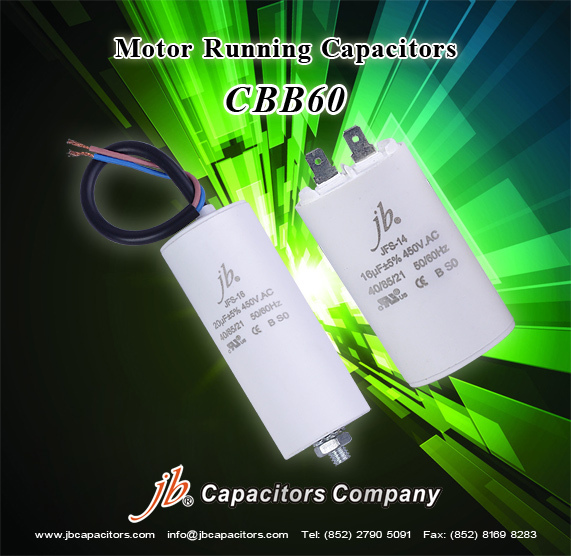 jb specialized in manufacturing Motor Running Capacitors CBB60 with UL approvals. We are just your best choice. Staying with us, you will be pleased with our quality, professional and excellent service. Applied to the operation or running of 50Hz (60Hz) single-phase motor, such as washing machine, mini type electromotor as well as household electric appliances. jb is well prepared for cooperation with all customers in the future. We can provide you the most professional support on technical & marketing side. 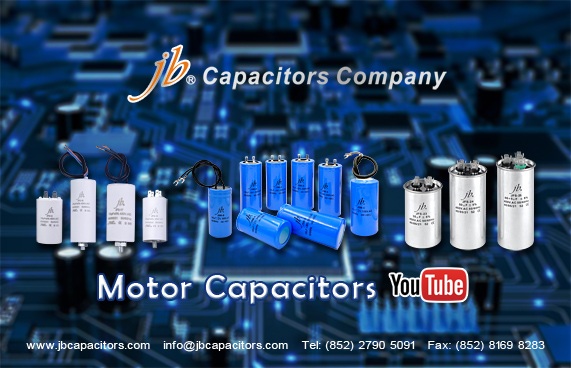 Recently, jb uploads new video of Motor Capacitors on YouTube. Have you seen it? 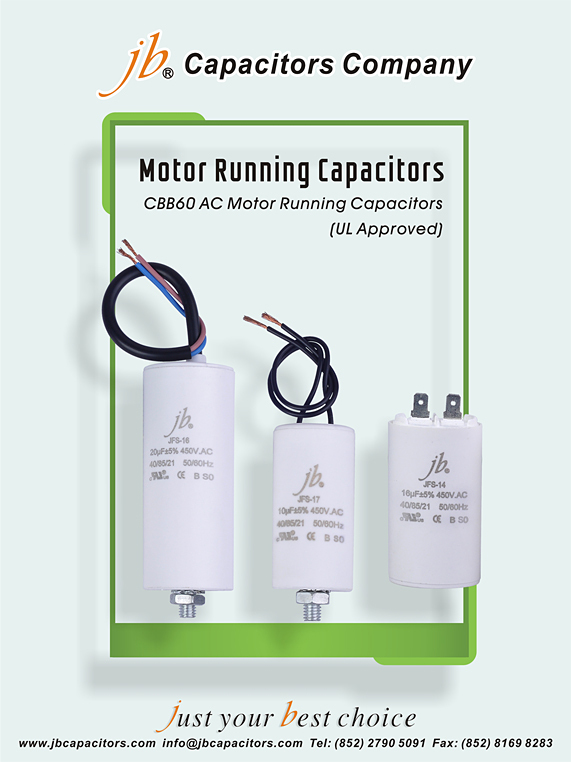 This time we mainly introduced jb JFS AC Motor Running Film Capacitor CBB65. Its actual shape, structure and printing will be showing on the video. It’s a good chance for you to check it. 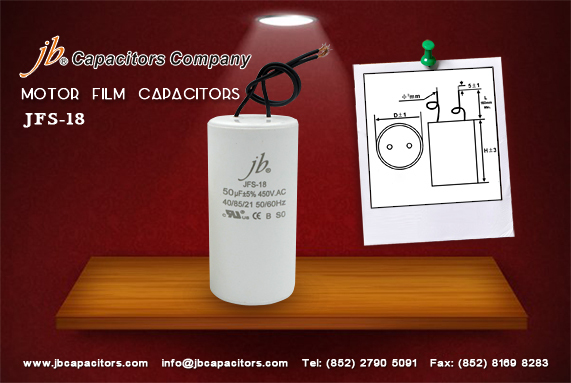 We sincerely invite you to follow us, jb Capacitors YouTube. 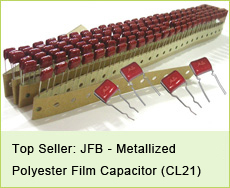 More new videos will be uploaded in the future, in which for you to know more jb Capacitors products and latest news. jb sell high quality and quite competitive price for motor capacitors. 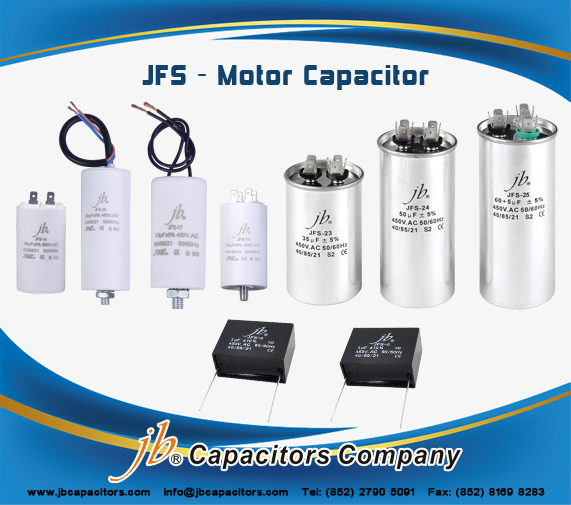 jb motor capacitors have the same product performance and quality with some international famous brands, the important thing is we can help you reduce your cost. guide. Please conduct a detailed confirmation with our sales staff when you ordering products. * - Followed by suffixes. % - Followed by .0 thru .9, followed by two numbers, followed by .0 thru .9.